As early as 1862 Governor Addison Gibbs recommended to the Oregon Legislature the establishment in Salem of an asylum to provide for the care and medical treatment of "insane and idiotic persons". Prior to the passage of any act dealing with the insane, each county had dealt with such unfortunate citizens on an individual basis. A document in the Oregon Archives offers an instance of this bid procedure: dated August 6, 1845, William P. Dougherty of Oregon City awarded a contract for "Boarding, clothing, and keeping" Eli Smith, "a lunatic," to Andrew Hembrie for $1.00 per day. Hembrie was under $600 bond to fulfill the contract. Similar contracts could be found in each of the counties, usually under "Pauper Accounts." 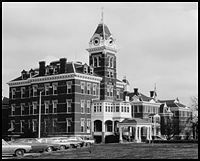 By 1862, Dr. J. C. Hawthorne had opened his Portland Institute for the Insane. Marion County, along with most of the counties then in existence, contracted with Dr. Hawthorne to care for their citizens "of unsound mind." At county expense, these unfortunates were shipped to Portland. 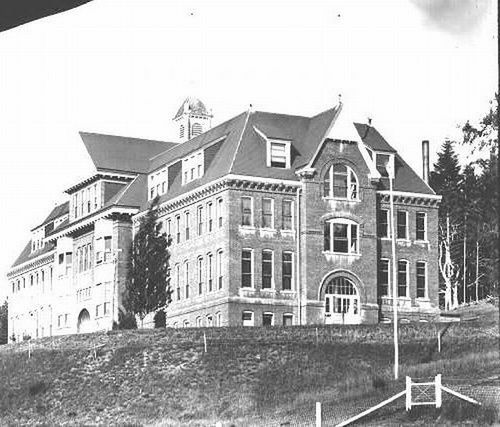 Prior to this, in 1894, construction was started on a building designated to be the Oregon State Deaf-Mute School, and was so occupied during the years of 1896 and 1897, but because of the inability to transport supplies over the nearly non-existent roads this building southeast of Salem was abandoned. After the Legislature enacted the laws for a sanatorium for treatment of the tubercular, one of the senators of that time saw this site, nestled in the foothills with available buildings, and action was taken to utilize this for the proposed Oregon State Tuberculosis Hospital.